Paruppu Usli is a very popular dish in Tamilnadu. There are various ways to cook it and I cook it with banana leaf and bamboo steamer. This method requires only 1 spoon of oil and I have used sprouts,moringa leaves and methi leaves for this. Banana leaf gives a good flavor and we no need to grease the leaf with oil as we do it if we steam with idli plates. Steaming in bamboo steamer has various health benefits and flavorful too. The bamboo basket used in this post is usually used for cooking Dim Sum - a Chinese dish which is famous here. However I use this for making idiyappam & kozhukattai. 2.The ingredients must be blended well as a very nice paste. 3. Take the bamboo steamer and place a banana leaf in the bamboo steamer. Make a hole in between for the steam to flow nicely. 4. Place the sprouts and spinach without adding any salt in one basket and the ground ingredients in another basket. 5.Take a wide pan and put 2-3 inches of water and put a small stand which can hold the steamer basket. 7. Keep checking once in a while after 30 mins if the steaming is done. This must be in medium flame. You may remove the vegetable basket on top as it gets cooked faster than the channa dhal. Once the steaming is done take out the basket from the pan and let it cool down for 15 - 20 mins. 7. Once cool down, remove the banana leaf from the dhal mixture. It comes out very easily. Crumble a bit and put in a mixie jar. 8. Grind it 3 - 4 times to get the below grudgy texture. 9. Take a non stick pan and put 1 spoon of oil and 1 spoon of mustard. 10. Once the mustard starts to crackle, put the beans & spinach which is steamed and give it a stir. 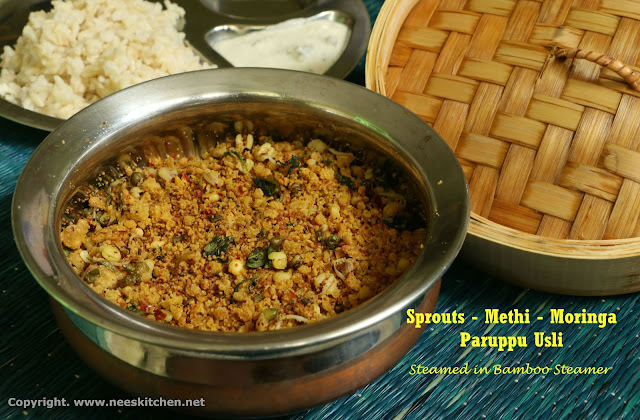 You may use any of the regular vegetables used for paruppu usli. Steaming in idli cooker only takes 15 mins but steaming in bamboo basket takes a longer time. Bamboo basket is available in many Asian stores and are inexpensive too. The salt in the picture is a Himalayan pink rock salt. It has its own benefits and I use them in some of my cooking. You may use the regular salt.